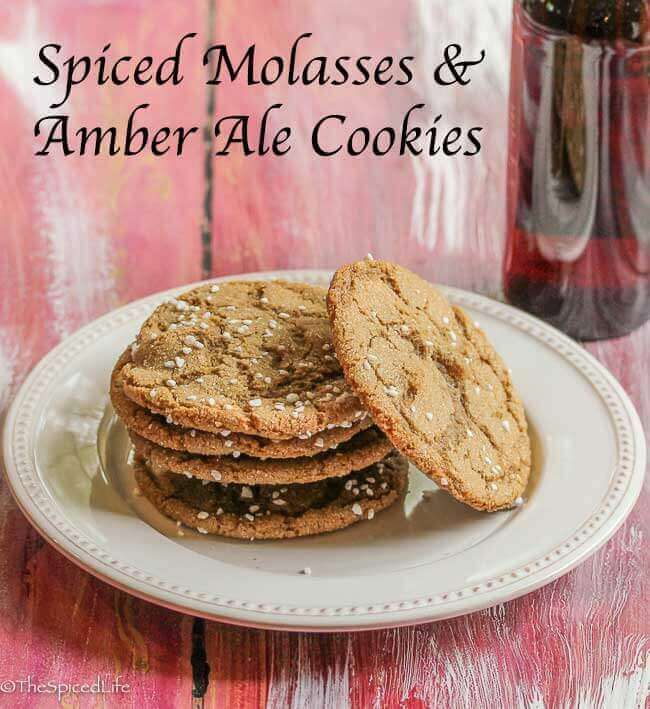 Spiced Molasses Amber Ale Cookies are a delicious twist on spiced molasses cookies, with an alluring malty undertone from the amber ale. 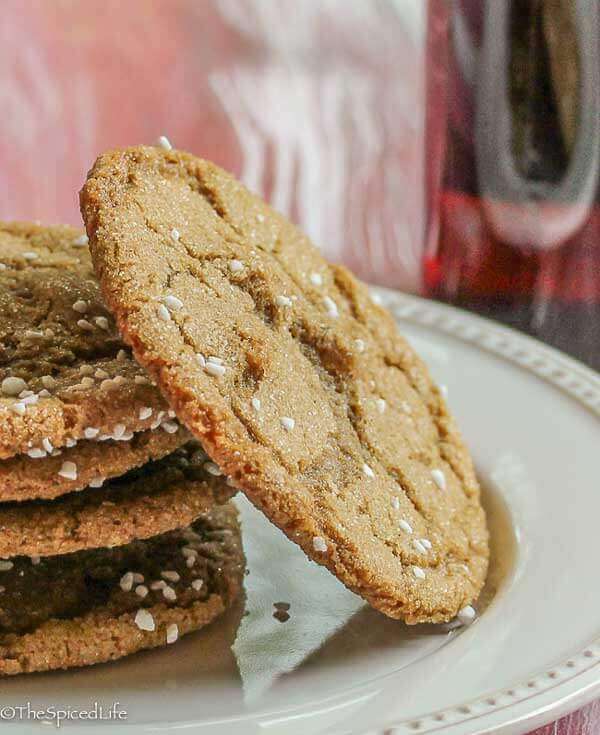 I learned an important lesson when making these Spiced Molasses Amber Ale Cookies. Don’t ever try to boil beer on the highest heat, especially not on an induction power boil setting. Suffice to say it took two bottles of beer to make this recipe–and it was worth the ensuing mess and mop up, but there was a serious mess and mop up. Thank goodness for the flat induction cook top, which is easy to clean. When it says simmer the beer, it means bring it gently to a simmer. And make sure there is plenty of room above the beer in the saucepan. I found this recipe in King Arthur’s Fall 2018 issue of Sift, and immediately knew I was going to make it. I was completely intrigued by the reduced beer syrup in a molasses cookie. 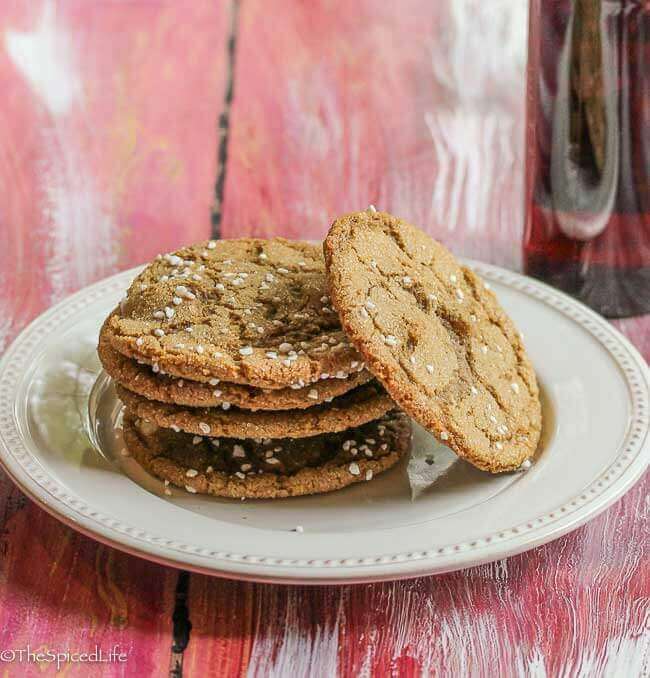 I was not completely sold on the crystallized ginger and raisins–although check out Karen’s version for an opinion on including those, and so I left them out. I was concerned however that the cookies might be too bitter (the dough had a bitter edge but baking mellowed it out) without the raisins, so I added white chocolate chips to them. We were split about 60/40 on the white chocolate, with about 40% preferring them with the white chocolate and 60% of us (including me) preferring them without the white chocolate. I especially preferred them without because I thought the vanilla in the white chocolate obscured the maltiness of the amber ale. So I have listed the white chocolate as optional. You might be wondering why Swedish pearl sugar? The truth is I get bored of the same old sugar coating. Feel free to use sanding sugar, coarse sugar, turbinado sugar, demerara sugar, sparkling sugar, or just regular fine white sugar. Whatever floats your boat. I love the sandy coating from fine sugar but I also love the crunch of a coarser sugar and often the look of a coarser sugar, so I like to combine them. 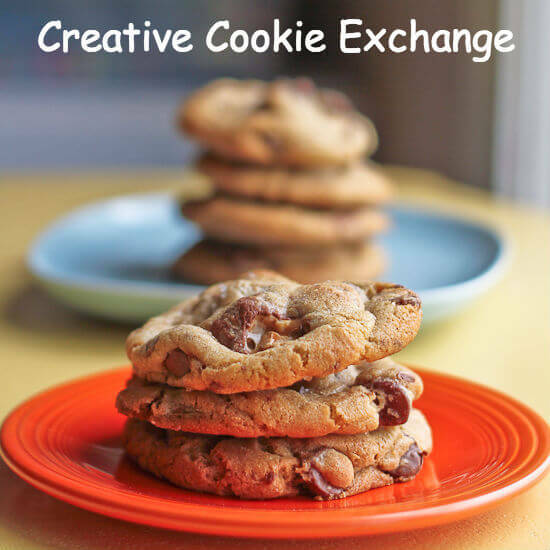 If you are wondering what crazy soul thought baking with beer in cookies would be a great theme for Creative Cookie Exchange that would be yours truly. I am not a big beer drinker–ironically–but like many interesting flavors I am excited to combine it with other flavors even if I don’t want it straight. 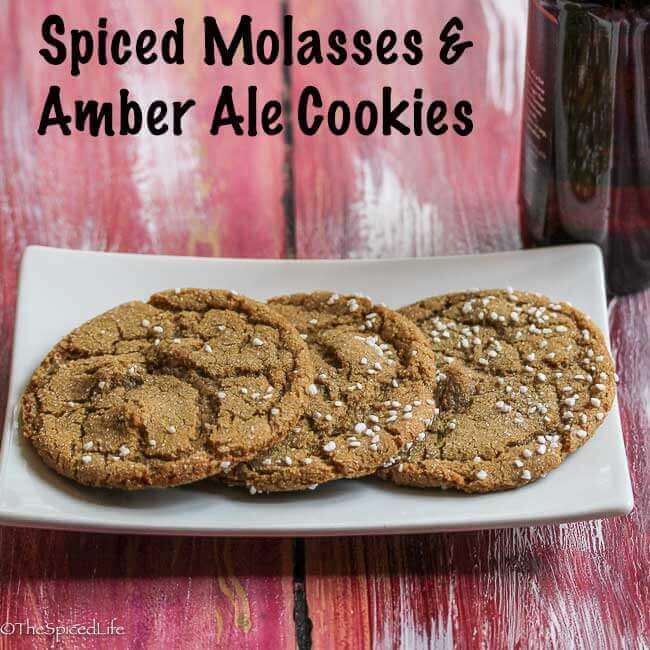 These Spiced Molasses Amber Ale Cookies were such a hit that I am tempted to boil (ahem, simmer) down the rest of the six pack and see what else I could add Amber Ale syrup to. Kudos to the rest of the Creative Cookie Exchange bakers who took my Beer in Cookies challenge and ran with it. Closely adapted from King Arthur. The white chocolate is optional--leave out if you think you will especially enjoy the malty depth of the ale; if you have a super sweet tooth, then use it. This recipe uses a mixer but it also uses some saucepans, plus it requires chilling time, so read through the entire recipe before starting. Gently bring the ale to a simmer in a medium saucepan over medium low heat, stirring occasionally. Pay close attention and reduce the heat if it begins to foam up. In a new medium saucepan set over low heat, heat the butter, molasses, 2 1/4 cups sugar, and salt. Stir often, until the butter melts and the sugar and salt dissolve, about 10 minutes. Remove from the heat. Stir the spices and the amber ale reduction into the butter mixture. Set aside to cool for 10 minutes. Whisk together the flour and baking soda in the bowl to a stand mixer (or a large bowl and use a hand mixer for the following). Turn the mixer to low and slowly pour in the liquid ingredients. Scrape the sides and bottom of the bowl. Add the egg. Mix until well blended and a thick batter forms. Stir in the white chocolate chips if using. Cover the dough and refrigerate for 1 hour, until firm. Preheat the oven to 350°F. Line two baking sheets with parchment paper or silicone mats. Whisk the 1/2 cup fine sugar with the Swedish pearl sugar in a shallow bowl. Place it beside the prepared cookie sheets. Scoop the dough into 2-tablespoon sized balls. Roll the dough balls in the sugar to coat, then place on the prepared baking sheets, 2 inches of space between them (I baked 12 to a sheet). Bake the cookies for 14 minutes, until the edges start to brown. Let them rest for 5 minutes on the cookie sheet, where they will continue to bake outside of the oven. The cookies will be crispy and chewy, and will store well in airtight containers when cooled completely. *If you feel compelled to taste the reduced ale, expect it to be quite strong and quite bitter. Don't worry! Beer in cookies? 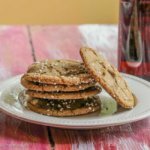 Heck yeah beer in cookies! Beer has great depth that plays well with sugar–keep reading to see what all we made! 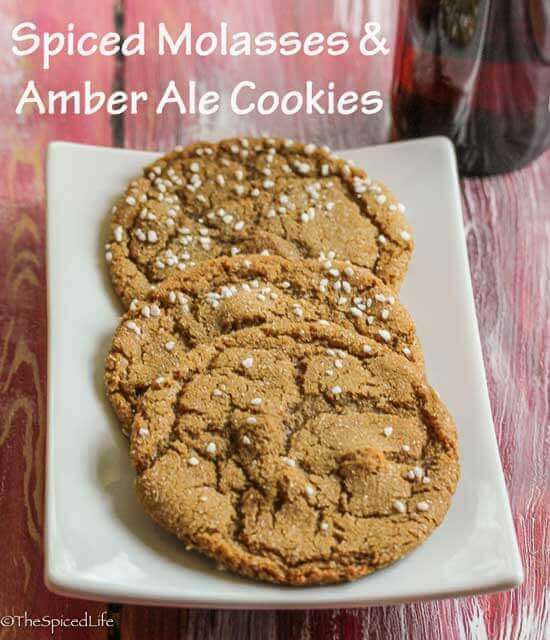 Looking for a vertical Spiced Molasses Amber Ale Cookie pic to pin? Ha, so I’m the only one so far who didn’t think to make a reduction of the beer. *forehead slap* Next time! I love how perfectly round your cookies turned out, Laura. They are beauties! 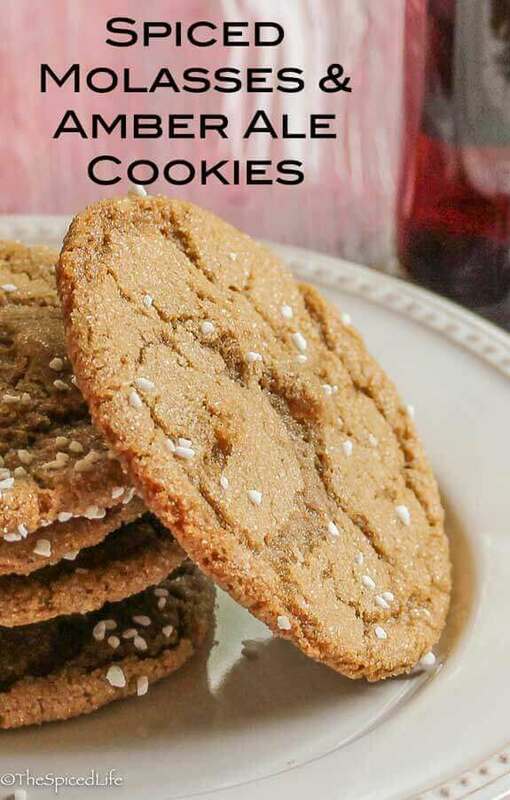 LOL thank you–I grew up rolling round balls of dough for my family’s gingersnap recipe. And the recipe called for reducing -it would not have occurred to me otherwise! I too had to go through two bottles of beer after letting the first one foam up over the pan! Ha ha! Yours look fabulous! I love the Swedish pearl sugar. OK I won’t lie that makes me feel a bit better! These look deliciously crisp. My beer certainly foamed up, but I was probably over-cautious and kept the heat low and it took ages to reduce. I really enjoyed this theme – probably the Aussie coming out in me – and I’m looking forward to trying everyone’s recipes.